I don't know about you, but the day after Christmas is usually spent sleeping off the Christmas Dinner of the day before. In Ireland, that day - that 26th of December - is a celebration in and of itself. Saint Stephen's Day marks the celebration of St Stephen, apparently Christianity's first martyr. Betrayed by the worrisome presence of a wren - a small bird of wondering heritage - the poor Saint was stoned to death by invading Vikings. 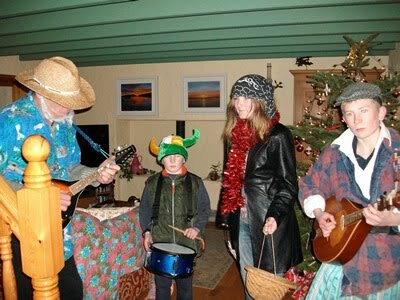 Often, the small group will be dressed in costume and whatever comes to hand: old Santy hats, Irish football jerseys, and mad wigs. All I know is that the lazy day after Christmas is made brighter with the appearance of the Wren Boys. In Eyeries, we have more than our share of crazed human beings who delight in giving their neighbours a spot of almost free entertainment. Constant knocks on the door all the morning gave me much pleasure. Next year I think I'll try it myself, if they'll have me. 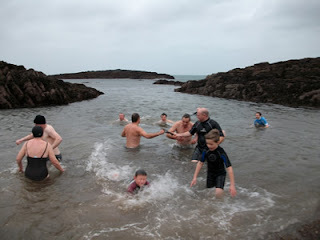 Ah, but if you think performing in wild costumes on what had to be one of the coldest days of the year is nuts, how about taking a swim in Coulagh Bay? Sounds crazy? You're right. But that's exactly what some of the more crazed residents of Eyeries did on this St Stephen's Day. My God, but it must have been well below freezing. The wind was howling. Snow glistened in the surrounding fields. Combers pounded the rocky coastline tossing spume high into the air. 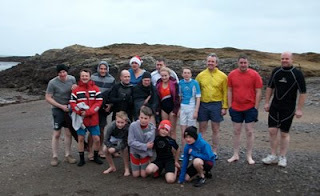 But did that stop the erstwhile swimmers from Eyeries, County Cork? You guessed it. It didn't. Fortified with mugs of hot mulled wine (for adults only, naturally), male, female, young and old plunged into the cold sea apparently to provide exceptional entertainment to those who refused to join them. Did I go swimming on St Stephen's Day? Not on your life. Not even next year. And that's a promise. Did Canada have the first Thanksgiving?